3D scanners Artec Eva and Space Spider are now publicly available at the Technical University of Munich. July 8, 2016, Munich (Germany) – Artec 3D, a leading developer and manufacturer of professional hardware and software, has announced support for MakerSpace, a high-tech workshop at the innovation center UnternehmerTUM, based at the Technical University of Munich (TU München). From now on all members of MakerSpace will have access to Artec 3D scanners Eva and Space Spider. The open workshop concept is unique to Europe and the first of its kind on this scale. MakerSpace was started in cooperation with the BMW Group at the Entrepreneurship Center in Garching near Munich. Laid out on 1.500 sq m are various production areas, such as workshops for machines, metal, wood, textile and electronics. Using 3D printers, laser cutters and water jet cutters, new forms can be created and all materials processed. MakerSpace is a high-tech workshop at the innovation center UnternehmerTUM, based at the Technical University of Munich (TU München). Following the principle “Prototype over Power Point presentation,” the innovation workshop is a meeting point for BMW, Bosch and Siemens staff, as well as students, start-up founders and handicraft enthusiasts: MakerSpace is accessible to everyone. The only preconditions are paid, monthly membership and a half-day introduction tutorial for each machine. Phill Handy is head, contact person and soul of the manufacturing workshop. Thanks to his American background Phill is able to convey the spirit of the DIY culture in Germany. “It is about the exchange of ideas between people, regardless of where they work, whether they are students or just enthusiasts,” says Phill. “Artec handheld 3D scanners are exactly what we needed, they complement our product portfolio perfectly well,” says Phill Handy, CEO of MakerSpace. Artec and MakerSpace go together not only technologically – their company philosophies share much in common as well: Artyom Yukhin, CEO and co-founder of Artec 3D, has been promoting the use of 3D technologies among consumers by extending access to them to bigger audiences. By providing scanners to MakerSpace, Artec makes another step towards this goal. In order to allow smooth integration of 3D scans in CAD workflow, Artec Studio 11 allows for direct export into various CAD programs. 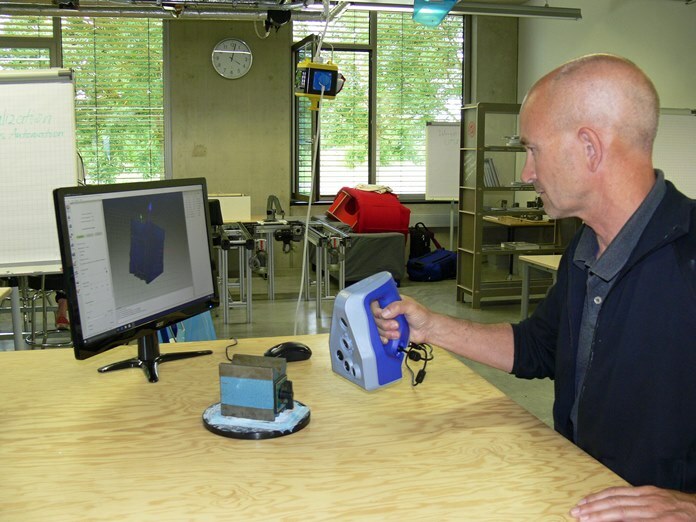 The handheld 3D scanners can now be tried out at MakerSpace to prove their user-friendliness. Also, the newly released version of the company’s own software Artec Studio 11 adapts to users who have no scanning experience. Thanks to various automated features, such as the Autopilot mode, high-quality 3D models can be created with ease and precision. Autopilot leads the user through the scanning process with a few simple questions regarding the characteristics of the object scanned and the required kind of the final 3D model. Then Artec Studio 11 deletes unnecessary data, automatically aligns scans with a mouse click and chooses the most effective 3D algorithms for the available data. The result is a high-precision 3D model of the same quality as one created by an experienced user. In order to allow smooth integration of 3D scans in CAD workflow, Artec Studio 11 allows for direct export into various CAD programs. Artec Space Spider easily captures small objects with multiple details. Artec Eva is most suitable for digitizing organically formed, bigger objects in fine detail. Inspired by space research, Space Spider features automatic temperature regulation that ensures the optimal operating temperature of 36.6 °C during the whole scanning process and thus highly precise scan results. Using LED light, the 3D scanner that weighs only 850 grams easily captures small objects with multiple details, such as casting forms, circuit boards and other industrial pieces with complex geometry, sharp edges und small parts with the resolution of up to 0.1 mm. The handheld 3D scanner Artec Eva is most suitable for digitizing organically formed, bigger objects in fine detail. Eva scans even moving objects in real time at up to 16 frames per second. Both scanners provide precise information on colors and form, based on LED projection. 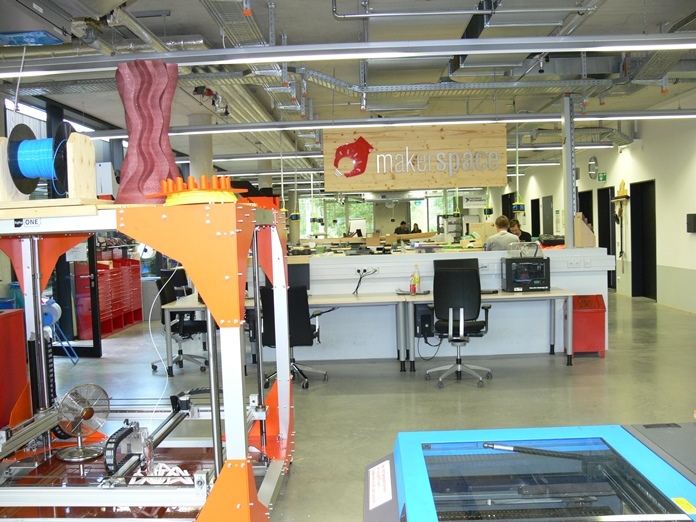 MakerSpace is a unique environment, offered by UnternehmerTUM to implement ideas and innovations in the form of prototypes and small series. It is a publicly accessible, 1,500 sq m high-tech workshop space that grants start-ups, engineers, architects, designers and makers access to machinery, tools and software as well as exposure to a creative community. This unique workshop concept was realized in cooperation with the BMW Group at the Entrepreneurship Center in Garching near Munich. Available at MakerSpace are various production areas, such as workshops for machines, metal, wood, textile and electronics. Using 3D printers, laser cutters and water jet cutters, new forms can be created and all materials processed. The MakerSpace team offers training and consultation services as well as events for people with different levels of knowledge. Apart from the BMW Group, Maker Space is also supported by a number of other well-known companies: EOS has provided the most advanced laser sintering 3D printer to date, Bosch supplies the workshop with the newest professional power and electronic tools, and National Instruments has brought in an integrated hardware and software platform for measuring, control and regulation systems. Autodesk has created a comprehensive work environment for processing design, construction and manufacturing data. The research foundations Zeidler-Forschungsstiftung and Hans Sauer Stiftung award scholarships to MakerSpace users. High-precision 3D scanning and smooth 3D model export into SOLIDWORKS becomes even more accessible to engineers, designers and product developers thanks to Artec’s new special offer. Scan and create manufacturing-ready designs in one seamless workflow.